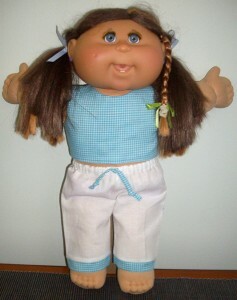 Well there seems to be lots of Cabbage Patch Kids featured in my Share and Tell blog this month, and they’re a pretty cute looking bunch too! 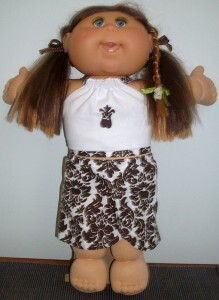 Jennifer has been super busy making lots of new outfits for her sister’s Cabbage Patch doll. Seems like the Pinafore dress has been a bit of a favorite! I have been a self-taught sewer for 40 odd years and watching your videos. I have learnt so much. Thank you for making my sewing days a lot easier. I am on fire. I made 2 Halter neck tops, plus I have cut out several patterns. My son called in to see me and he said I can see how happy this is making you. That touched my heart. 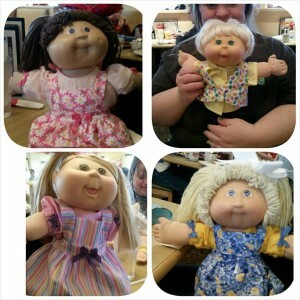 Belinda found she has a family of 7 Cabbage Patch dolls of all different sizes and she had a major challenge in front of her to clothe them all without stressing out! 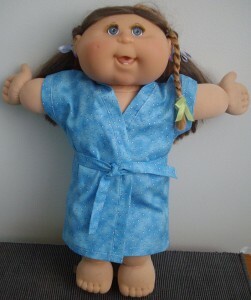 Yep, Cabbage Patch Kids have been made for many years now by different manufacturers and because they are a cloth body even dolls that are the same length and produced at the same time are often slightly different is girth due to the differences that can happen during the stuffing process. Well, the good news is that Belinda has been doing my How to Make Doll Clothes video course and she’ll probably find that most of the 18 ½ inch Cabbage Patch Kids bonus patterns that come with the course will fit the smaller 16 inch Cabbage Patch Kids dolls as well without too much adjustment, perhaps just a shortening of the hem or strap. 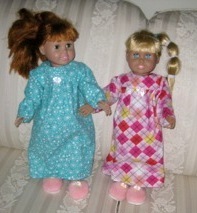 This is her 16 inch doll wearing the nightie – only the straps needed shortening. 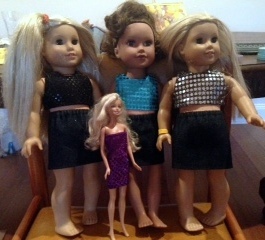 And now to the 18 inch and American Girl dolls and their latest fashion pieces! First we have Michelle who had a very successful sewing day with her four girls. They used up Mum’s sequin stash and did an awesome job! I look forward to seeing more from these girls. Pic of the girls efforts. Thank you, our dressmaking was a success! 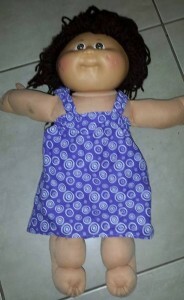 Next is Peggy, who is a regular contributor to my Share and Tell page and she often sells her doll clothes at markets. We can see why, they are simply wonderful! 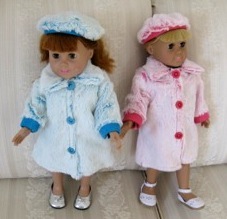 Just saw your blog and remembered that I used your pattern to make doll coats when I was home over the Christmas holidays. Thought you might like to see them. I used your fur trimmed jacket pattern and lengthened it to make coats. I then found a beret pattern to make matching hats. Thanks to everyone who has sent in photos and shared their sewing experiences. It’s truly wonderful to see what you have created and hear the story behind it.